No annoying adverts! No irritating "Like" buttons! Just good fun! A simple but addictive colour-based puzzle game in a retro-stylee, that will keep you entertained forever (or several months, anyway…)! And it runs on older devices too (still got an old iPhone 3G kicking about?). The aim of the game is to prevent the coloured blocks that drop down from the the top of the screen, from filling up the game grid. 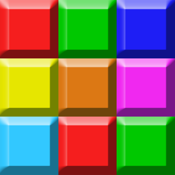 To accomplish this, you must remove blocks from the game grid by placing three or more same-coloured blocks in a row either vertically, horizontally, or diagonally. Every time you do this, these blocks will disappear, and the blocks above them will drop down to fill the gap left by the blocks that were removed. You also have a 'smart block', or Bomb at your disposal. This is a special block which will remove all the blocks from the grid which match the colour of the first block that your bomb drops on to. The next block that will appear once the current block has finished its course is displayed in the "next" area - use this to plan your strategy (not available at difficulty level Hard). The speed at which the block drops down the screen will gradually increase as the game progresses. The game is over when there is not enough space at the top of the game grid for a new block to appear.